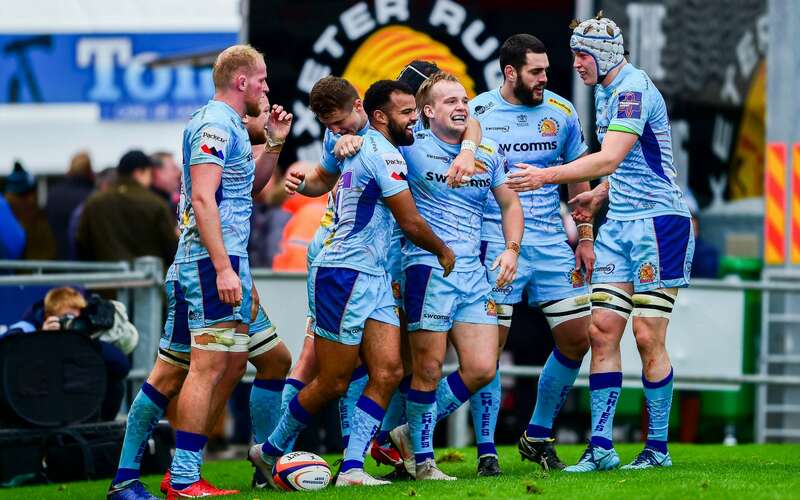 It's been the breeding ground of future stars at Exeter for many a year and today the Chiefs were able to unearth some new sparkle as they cemented their position at the top of Pool One in this season's Premiership Rugby Cup with victory over visiting Harlequins. In a dominant display from Ricky Pellow's side, they not only preserved their unbeaten record in the competition this term, but they underlined the quality that exists within the playing ranks at Sandy Park. Whereas many Premiership rivals took the opportunity to re-introduce a number of their top guns ahead of next week's return to top-flight action, the Chiefs stuck with those who have served them so well in the opening two rounds of battle. Keen to give youth it's chance to shine on the big stage, those entrusted with the jersey once again did not disappoint. Billy Keast, Marcus Street, Josh Caulfield, Richard Capstick, Harvey Skinner and Alfie Petch all put in decent shifts, emphasising once more the incessant conveyor belt of talent that exists within the Chiefs ranks. Having opened up with a draw at Newcastle Falcons and then a victory at home to Bath a week ago, the Chiefs were banking on home advantage to pay dividends once more as they looked to maintain pole position in Pool One of the competition. As expected, coach Pellow stuck with a large nucleus of the players who had featured in the opening two rounds. However, there were changes - including a first start of the season for lock Mitch Lees, as well as recalls to the starting line-up for Alex Cuthbert and Stuart Townsend, who was captaining the Chiefs for the first time in his career. Harlequins, meanwhile, were looking to bounce back from their narrow loss at home to the Falcons on Sunday. They welcomed back a number of key names for the trip to Devon, including young playmaker Smith, as well as Matt Symons, Luke Wallace and Ben Tapuai. And it was the visitors - who had first use of a decent tail wind at their backs - who started this encounter the brighter. Just three minutes had elapsed when Marcus Smith slotted them in front, the Quins’ No.10 landing a penalty from 35m out after the Chiefs were penalised for holding on in the tackle. Minutes later and Smith had the chance to double his - and his side’s tally - with a second pot at goal. However, this time he could not capitalise, pulling his shot at the target wide of the mark. 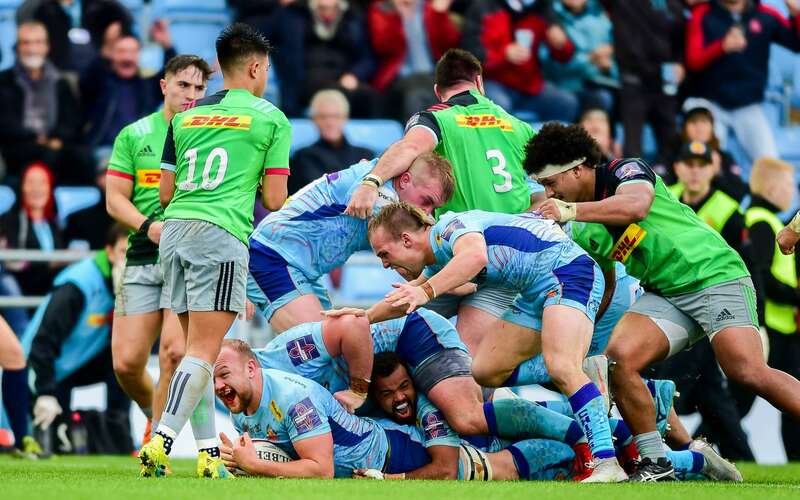 The Chiefs made the most of the let-off and having happily soaked up all that Harlequins could throw at them in a fairly one-sided opening quarter, it was the turn of the home side to finally click into gear. A succession of penalties allowed the Chiefs not only the opportunity to glean decent territory but, more importantly, possession with a line-out just five metres out. Although the initial home thrust was repelled by the visitors, Pellow’s side were able to recycle quickly, edging their way ever closer to the try-line, the fruits of which resulted in a maiden score for Capstick, which Joe Simmonds duly converted. Up and running, the Devonians were starting to find some real rhythm in their play. Tom O’Flaherty and Cuthbert were ever-willing workers coming off the flanks, while up front the forwards were never shy of looking to get in and amongst their counterparts with some heavyweight carrying. A counter down the left wing created the platform for a second Exeter try, claimed by Keast, who applied the finish from close range to some more powerful approach play from the Chiefs pack. If that was a hefty blow to take on the chin for the visitors, the Chiefs followed it up just two minutes later with an even bigger blow as the lively O’Flaherty claimed a third score when he scythed his way through the heart of the Harlequins midfield to touchdown. Smith momentarily countered with a second successful penalty for the visitors, but as half-time approached it was the Chiefs who added to their tally, claiming the all-important bonus point score with the clock deep into the red. Again, a series of penalties had allowed the home side the chance to set-up camp deep behind enemy lines. Elvis Taione instigated an initial foray down the blindside, but when they gleaned another opportunity with a line-out, the home pack combined as one to drive Tom Lawday over for the score. Harlequins introduced Dave Ward and Dave Lewis, the latter of whom used to operate in this very parish for the Chiefs, to help re-ignite their charge on the resumption. However, the opening skirmishes failed to deliver anything meaningful for either side. When the action did open up, however, it was the Chiefs who extended their lead just before the hour mark. Working the ball from right to left in the blink of an eye, it was the link up between Tom Hendrickson, Sam Hill and O’Flaherty that created the space for Simmonds to glide over for their fifth try, which he was also able to convert. Harlequins did their best to salvage a rapid response, No.8 Alex Dombrandt leading their charge, but the Chiefs defence was in no mood to cough up soft points, producing a rearguard action that was getting a glowing seal of approval from coach Julian Salvi in the back of the main grandstand. With the contest effectively signed and sealed in terms of the end result, Pellow took the opportunity to run his young bench. Into the fray came young props James Kenny and Alfie Petch, the latter for his first-ever outing at senior level, while behind Max Bodilly and James Short were both afforded the final quarter in which to remind the coaching staff of their prowess ahead of next week’s return to top-flight action at Bristol Bears. To their credit, the visitors kept plugging away until the death. The Chiefs, though, continued to be as miserly now as they were in minute one. A huge hit from Aussie international Dave Dennis on Ward underlined that very point, before the former Cornish Pirates forward snuck his way over with the final play of the game to claim a consolation score, which Smith duly converted. The competition now takes a break until the New Year, when the new 'Derby Day' fixture sees the Chiefs make the short trek up the M5 to face the Bears. They will, however, travel safe in the knowledge that they remain in control of their own destiny, particularly as they look to become the first-ever side to lift this trophy in successive years. Chiefs: J Simmonds; T O'Flaherty, T Hendrickson, S Hill (M Bodilly 69), A Cuthbert (J Short 60); H Skinner, S Townsend (capt, J Maunder 51); B Keast (J Kenny 58), J Innard (E Taione 10), M Street (A Petch 58); M Lees (D Dennis 30), W Van Der Sluys; J Caulfield, J Freeman (R Capstick 20), T Lawaday. Harlequins: R Chisholm (H Cheeseman h/t); C Walker (T Visser 50), A Morris (capt), B Tapuai, C Murley; M Smith, N Saunders (D Lewis h/t); L Boyce (N Auterac 50), E Elia (M Crumpton 54), W Collier (P Swainston 58); M Symons, D Lamb (B Glynn 40); A White, L Wallace (D Ward h/t), A Dombrandt (E Elia 69).